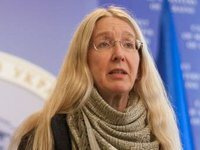 Ukraine's Health Ministry is working on the implementation of the government-funded program implying the creation of the Ukrainian heart center chain for implanting stents and treating heart attacks, acting Health Minister Ulana Suprun has said. "Under the initiative of the prime minister and the government the 2017 budget provides an additional UAH 150 million to buy angiographic equipment. This would help to create a heart center chain all over Ukraine. Each Ukrainian with heart attack would be able to go to hospital and be treated and have stent implanted free of charge," she said at a government meeting on Wednesday. "We would have enough equipment and stents to provide them to all patients. Now the program is being implemented. Clinics are receiving permits to conduct angiographic tests and buying equipment," she said. Commenting on the procurement of medicines and medical products using budget funds under the cardiovascular diseases program, Suprun said that a total of 7,179 stents were bought using 2015 budget funds when stents were procured via Ukrainian pharmaceutical companies. Over 10,000 stents are bought via international organizations using 2016 budget funds. "The fair tenders thanks to international organizations help to save an additional 3,000 people," she said. Suprum said that the ministry's team has improved the procurement process since August 2016 when it started working. "We have changed technical tasks for all our procurement to use the funds as better as possible," she said.